We believe that EdReady can (and should) be a key tool for teachers, career counselors, and anyone else who is tasked with facilitating math or English learning and transitioning students from one situation to another (e.g., to an institution of higher education). 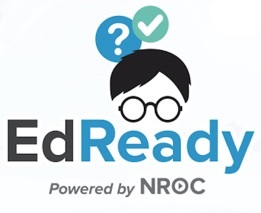 EdReady can provide teachers with additional data on student performance across the high-school math or English curricula, as well as for any academic college-readiness indicators for math or English. EdReady can be used to enable differentiated instruction (personalization) for every student in a math or English classroom, including individual resource recommendations from the EdReady resource library. EdReady can support “flipped classrooms” because EdReady is accessible anywhere there is an Internet connection, meaning that students can test and re-test themselves on their own time, leaving the class time available for teachers to support the students in using the recommended resources or other activities. There is any number of possible implementations and benefits from students using EdReady – what those benefits are, and how they are achieved, is really up to each teacher or facilitator to decide.